When my grands and I made the cozy village cakelets, back in December, I had a few leftover, which I stuck in the freezer. I pulled those out today and sprinkled them with some powdered sugar "snow" and put them on my snowflake-edged plates that I found at Kroger several seasons ago. 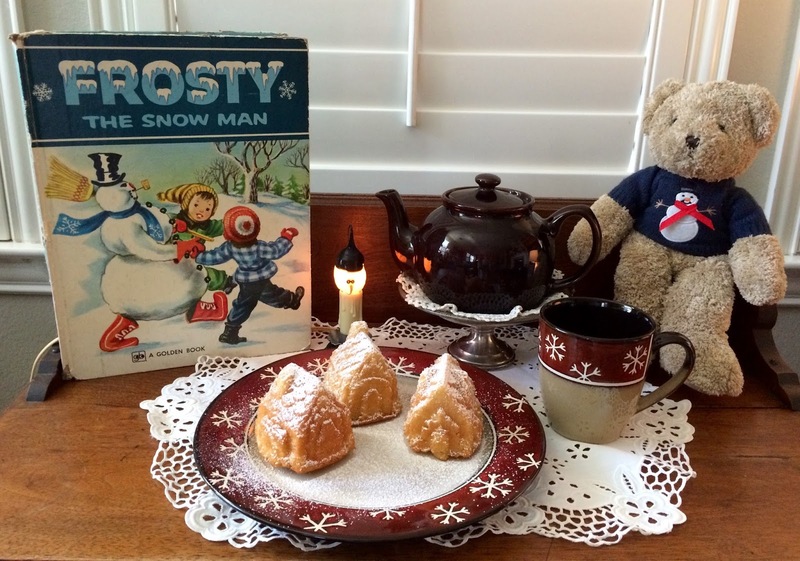 My teddy bear is dressed for the occasion, and I'm sharing my old copy of Frosty the Snow Man, back from 1976. My little electric candle has a snowman bulb to shine some glow on my tea table. Here's a close-up of my mug, which I'm having some Constant Comment tea, that goes well with the citrus flavor in the cake. Aren't these the sweetest little cottages? I had my two little neighbor boys over to decorate some, also, and the oldest, who is eight, said on the way out, "Thank you, Miss Kitty for having us over. That was so kind of you." Oh my goodness, my heart just melted right there on the spot! Heat oven to 350 degrees. Grease and flour Cozy Village Baking Pan; set aside (I used Baker's Joy). Sift together flour, sugar, baking powder, baking soda and salt; set aside. In a large bowl, combine yogurt (or sour cream), butter, eggs, vanilla and orange extract; beat on medium speed, scraping bowl often, until well blended. Add dry ingredients; blend on lowest speed, scraping bowl often, until well combined. Beat on medium speed 1 minute. Stir in orange peel. Spoon half of batter into prepared pan, filling each well 3/4 full. Tap pan onto countertop to release air bubbles. For best results, spread batter up to reach the top edges of each well, so it is slightly lower in the centers. Set remaining batter aside. Bake for 22-27 minutes, until toothpick inserted comes out clean. Cool 10 minutes in pan. Invert cakes onto cooling rack and cool completely. Wash and dry out pan. Prepare pan as previously instructed. Repeat filling and baking procedure with remaining batter. Decorate as desired. Makes 12 little cakes. I'm sure this would also make one large bundt cake. Here's the little cottage all decorated with icing and Rice Krispie treat trees. Teddy Grahams are the greeters! I just realized that I never shared this photo of the five of my seven grandchildren with their adorable cottages. They all turned out so cute and everyone could take one home to enjoy and not have to share. We used tiny candies, and sprinkles, all on foil covered cardboard . Don't they look proud!? Miss Kitty :-) I love that your neighbor thanked you like that...very sweet and I know they will always remember decorating the houses with you. Your grands look very proud sharing their creations, and it's nice that you froze a few cakes to enjoy after the holidays. Love the snowman bulb! Oh my...Kitty! How precious are your grandchildren...those smiles on their faces say it all, don't they? I love these ''cottages'' and I am sure they were lots of fun to make! How kind of you indeed to have your little neighbour boys over to helo you decorate...they must have loved that! Sending you so much love, dear Kitty! I always enjoy visiting with you! Precious grandkids,Kitty! 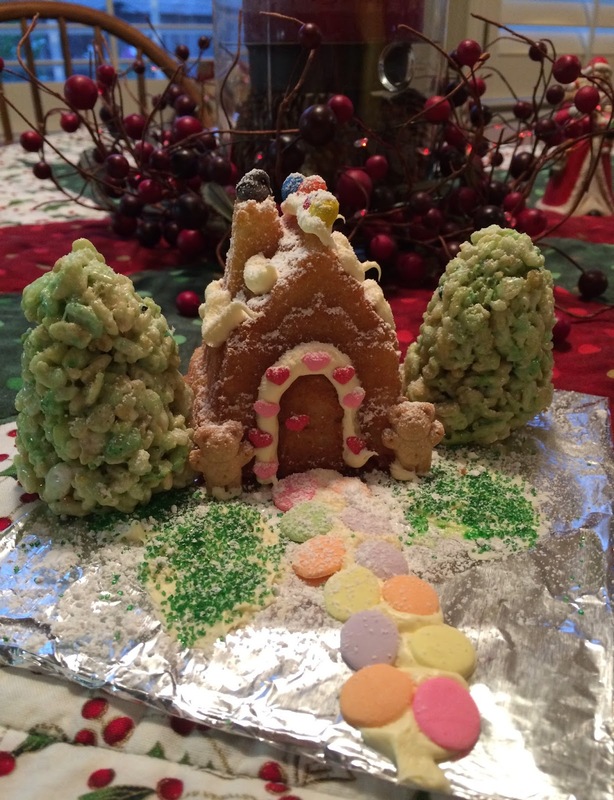 Baking with grandchildren is always great for making memories. Those cakes really look good. Love your plate and cup, goes great with this cold wintry weather. Sweetest Kitty, those cakes are darling, but your grandchildren are even more so! Their smiles just melt my heart :) You are simply one of the sweetest grandmothers and what a blessing to have one another. Have a delightful day, my friend. Sending LOTS of love your way! Nordic Ware makes the best pans! I just love your village! Perfect size for tea, and your grands thought so too! I love Constant Comment! Thanks so much for linking to Tuesday Cuppa Tea! Oh, how I love your post! We were both thinking snowmen when we wrote our posts today, because I featured snowmen too. Your Nordic cakes look wonderful, but the photos of your grandchildren are even better! Oh my goodness - the cutest thing I've seen! That is a wonderful photo of the grands and these precious "accomplishments". What great fun you all had and made such a wonderful memory with them! So glad you shared this special event. I also meant to say - I have that Frosty book down in the basement as it was one I bought for my kids! The little cottages really are adorable, especially the ones that went home with your smiling grandchildren. Wouldn't they be a special dessert for a tea party! What cute grands you have, Kitty...looks like they had fun decorating those darling little houses. They did such great jobs...so did you sporting the freshly fallen snow! Oh, the children certainly look proud of their creations!! The little cakes are adorable! 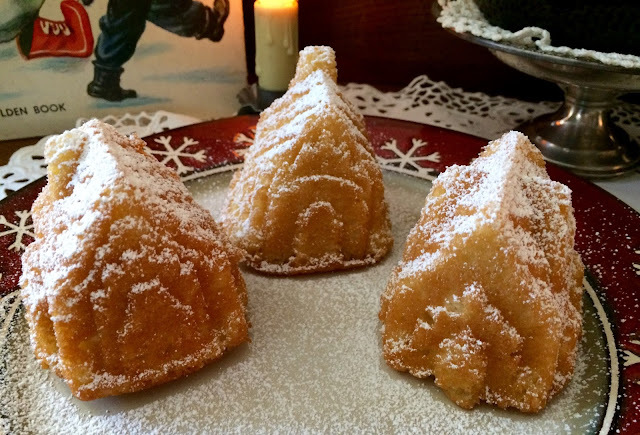 Oh, Kitty, those cottage cakes are the cutest and what fun the children had decorating them! Darling picture of them too. The mug and plate are cute too. You have to be the best grandma! Thanks for sharing with us. Dearest Kitty, this post just made me GRIN- so so cute - those grands are priceless, they look proud - and so happy! Love it! Hello Kitty, I think those kids had a great time, you were so kind to even invite those boys! And this really does sound delicious, and I think I will try it as a bundt cake... Did you ever see that movie, Fat Greek Wedding? You always make tea and a lovely treat look amazing! Hi Kitty, Aren't these cottages just the cutest. I love your creativity with your grands. They have the best time with you. Look at those wonderful creations they all made. What a precious photo. 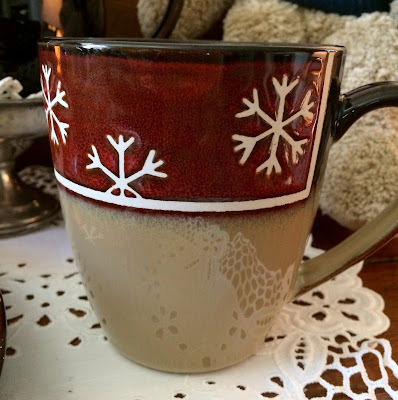 Love your winter tea today and the pretty snowflake dishes and mug. Really adorable for the season. Your neighbor kids sound so sweet and what a nice comment to say. Thank you for sharing the recipe. Lovely post Kitty. Oh what proud cottage makers they are! Such a great winter time activity. What a cozy tea you have set with your bear and Brown Betty teapot. I immediately noticed your Frosty book. I have saved a couple of my special childhood books and think about possibly starting a collection. They bring back such great memories. Happy 2016 to you. Those little cakes are so darling. What a cute idea for the holidays. Perfect for entertaining. Your grandchildren are adorable. Such happy faces. A beautiful photo of your grandchildren all looking so proud. I'm sure they enjoyed their day with you. Your winter mug is wonderful, I love it! And a great size. These little cakes are adorable!! I can only imagine how much fun all the kids had decorating them. Love seeing photos of your grands...so cute! All of your tea table decor is just perfect for this cold weather. Thanks for sharing the recipe! How sweet! Both your snowman tea setting and your super cute grandkids with their charming cottage cakes made me smile. Your grands do look happy and pleased with their cakes. You're a special grandmother! Just adorable Kitty...the cakes and the grands. *_* They all look so proud of their creations. So wonderful you're making so many memories with them. What a special recipe. How absolutely adorable. They will cherish the memories! I love your cute village mini cakes Kitty. What fun the neighborhood boys and your grandkids must have at your house! What adorable little cakes Kitty, and I just love the snow on the roof! I bet they are fun to eat too! You have so much cooking fun with your grands, I know they must love coming to visit! These are the cutest little "cakelets" I've ever seen. So adorable and look yummy! Kitty, I adore your sweet Frosty book! The cakelets are simply darling and what a mannerly neighbor boy you have. Love the photo of your grands. Thanks for sharing with SYC. Those cakes are so darn cute! Your helpers all look very pleased too. What fun! Your cakes are so pretty, Kitty. What a great idea to invite the grandchildren and neighbours over to decorate. Everyone looks so pleased and happy. Your snow-inspired scene is perfect for January, and that Frosty book is one I recognize! A winter wonderland tea party, Kitty, and the children look so happy. Those cakes are just too cute! I will be featuring THIS POST tomorrow on my featured blogs! Congratulations! Oh, I LOVE this Kitty! 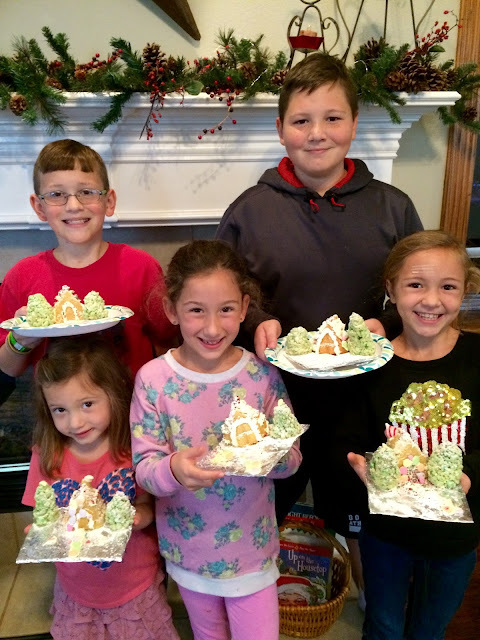 So sweet, And easier I would think than trying to keep those gingerbread houses "glued" together! I love the little teddy grahams at the door. What a fun project. I love the neighbor who called you "Miss Kitty." That's a southern thing right? My daughter's friend from Alabama always calls me "Miss Deborah." I love it. It's not as formal as Mrs., but it still denotes respect. Kitty, I am featuring your post at No Place Like Home today. Congratulations and enjoy your day. What precious grandchildren and a fantastic project! Your little mini cakes are just amazing! Thanks so much for sharing with us at Full Plate Thursday and hope to see you again real soon! Hello, Kitty! It's my first visit to your lovely blog. I came over from The Rose Chintz Cottage where you were featured this week. I found the exact same Frosty the Snowman book in my mom's attic last week!!!! It had belonged to my great aunt. It is in great shape and I'm thrilled to have it.